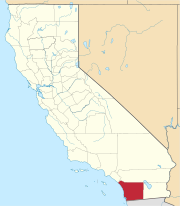 San Marcos is a city in San Diego County, California, United States. It has a population of 83,781 people. The city was incorporated on January 28, 1963. San Marcos has a Mediterranean climate with hot and dry summers and mild winters. The highest temperature ever recorded in San Marcos was 112 °F on July 22, 2006. ↑ "Monthly Average/Record Temperatures". weather.com. Retrieved August 10, 2015. This page was last changed on 9 August 2018, at 09:54.